Start the next chapter of your story. 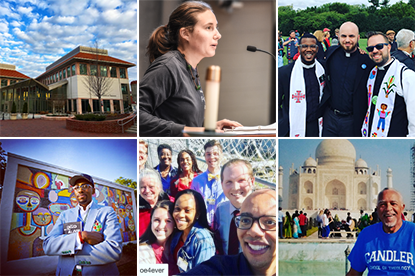 Your application to Candler is an opportunity to showcase your strengths, interests, theological maturity and individuality. It is the place to tell your real story. We look forward to learning more about you, and to helping you learn more about Candler! To ensure a smooth application process, please review the Application Requirements and Application Deadlines for your preferred degree before you begin. International applicants may also want to review the Admissions Requirements for international students. Individuals interested in any of Candler’s dual-degree programs must complete a separate application for the non-Candler degree program with the corresponding school. If you have any questions, you can check out our Frequently Asked Questions page, or contact our admissions team at any point in the process! Ready to get started? Please review the table below for the semester in which you can start your chosen degree program. Select the appropriate link below to start a new application or continue an existing one.